Enhances gloss and makes your paint pop! 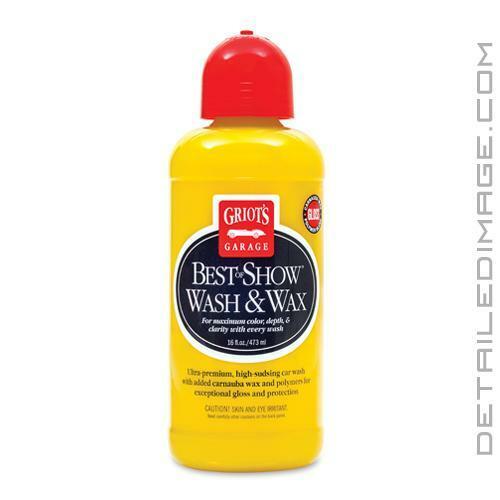 Clean and protect in one easy step with the Griot's Garage Best of Show Wash & Wax! When detailing you generally have to wash, dry and then protect, in that order. However, what if you are pressed for time, or are feeling a little bit lazy. With the Best of Show Wash & Wax you can combine the cleaning and protection steps for an easy, quick solution. The unique formula of Wash & Wax creates thick suds, which help encapsulate dirt and grime, allowing you to remove it safely and easily from the surface. This means stubborn road grime, light tar and bug guts, dust, dirt and other contamination can be removed with only a few passes with your favorite wash mitt. Once you remove the contamination, rinse the surface and you will be left with a layer of protection that not only lasts weeks, but helps enhance gloss, really making your paint pop! If you have any protection already on the surface, Best of Show Wash & Wax helps enhance the look and extend the life of that protective layer. What are you waiting for? Pick up the Griot's Garage Best of Show Wash & Wax and combine detailing steps! Ultra-premium, high-sudsing car wash with added carnauba wax and polymers for exceptional gloss and protection. Add color, depth, and clarity you can see, every time you wash your vehicle. Griot's Garage Best of Show Wash and Wax is packed with high quality carnauba wax that adds rich, deep gloss and maintains protection. Its thick formula quickly creates lasting suds that help safely remove dirt and grime. Don't just wash your car, maintain a Best of Show finish you will be proud of. Useful Directions: Vehicle should be cool to the touch. Add 1oz of Best of Show Wash and Wax per gallon of water. Rinse heavy debris off the car. Wash from the top of the car down, dipping and rinsing your wash mitt/pad frequently. Rinse residue off the car before it has a chance to dry. Dry with a PFM Drying Towel or high quality chamois. Tip of the Trade: Reduce swirls by using two buckets as you wash. One for rinsing your wash tool, the other for soaping up your wash tool. nice product. leaves clean glossy finish.